It is with great regret that the Club has to announce the death of Life Member Eric Thompson on 22 August at the age of 95. Eric became a BRDC Full Member in November 1948, having been co-opted into the BRDC team a couple of months earlier for the 12 Heures de Paris at Montlhery. In this, his first ever motor race, Eric shared an HRG with Robin Richards to finish fourth in class and 17th overall. Within less than a year, and with scarcely any more racing under his belt, Eric was sharing another HRG in the first post war Le Mans 24 Hours with Jack Fairman to finish eighth overall and winners of the 1500cc class. 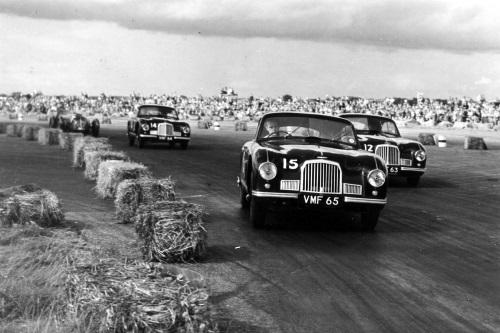 These and other HRG performances caught the eye of Aston Martin Racing Manager John Wyer who invited Eric to join the team for which he contested Le Mans from 1950 to 1954, finishing third overall in 1951 with Lance Macklin in a DB2, winning the 3-litre class. The last of these years, with the Lagonda DP115, was rather less rewarding when Eric damaged the car irreparably against the Esses bank early on and had to explain himself to John Wyer. With Reg Parnell in a DB3S Eric won the 1953 Goodwood Nine Hours and finished second in the RAC Tourist Trophy at Dundrod behind the sister car of Peter Collins/Pat Griffith. Although perhaps best known for his sports car exploits, Eric occasionally raced Rob Walker’s Connaught A-type with success which led to an invitation to drive a works A-type in the 1953 British Grand Prix in which he finished fifth, scoring points on his first and only appearance at this level. An insurance broker by profession, Eric had to squeeze his motor racing into his annual three weeks’ holidays and weekends and it was pressure of work which led him to retire from driving after sharing a Connaught AL/SR sports car with Kenneth McAlpine at Le Mans and the Goodwood 9 Hours in 1955. Eric retained his involvement in the sport as a timekeeper for Aston Martin, for many years was one of the most highly regarded dealers in motor racing literature, and was one of the most charming elder statesmen of the BRDC who will be much missed. Eric's funeral will be held at the Guildford Crematorium on Wednesday 2 September at 12:45pm. Condolences have been sent from the Club to Eric’s son Anthony.